The Los Angeles Sheriff's Department San Dimas Station has recently seen an increase in counterfeit currency being passed in restaurants and small businesses. The counterfeit notes are mostly 100-dollar and 50-dollar denominations – AND most importantly, many of these bills cannot be detected by counterfeit detection pens or lights. The counterfeit money contains various serial numbers and banknote identifiers on the bills. San Dimas Station detectives are asking for anyone who comes into contact with this counterfeit money to immediately call San Dimas Station [(909)450-2700]. The information below and via the Secret Service links illustrate certain identifiers on real United States currency. Consumers and retailers should examine paper currency that they receive during the course of a transaction. Anyone dealing in cash transactions should be aware of the security features of United States currency which are intended to deter counterfeiting and identify counterfeit bank notes. Compare a counterfeit bank note with a genuine one of the same denomination. Look for differences, not similarities – and check both sides! 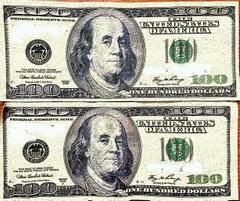 Counterfeit bank notes often share the same serial numbers. If given a counterfeit bill, make note of the passer's description and if possible, obtain a vehicle license number. Call San Dimas Sheriff’s Station immediately. Handle the counterfeit note as little as possible to avoid obscuring fingerprints on the bill. Anyone with information regarding these incidents is asked to contact San Dimas Station at (909)450-2700. Micro-printing: There are tiny micro-printing on the security threads: the $5 bill has “USA FIVE” written on the thread; the $10 bill has “USA TEN” written on the thread; the $20 bill has “USA TWENTY” written on the thread; the $50 bill has “USA 50” written on the thread; and the $100 bill has the words “USA 100” written on the security thread. Micro printing can be found around the portrait as well as on the security threads. Comparison: Compare the feel and texture of the paper with other bills you know are authentic – EXCEPT that some counterfeit large bills are made from “washed” small-denomination bills, so they feel similar to real currency. Remember, if you are passed a counterfeit bill, you own it. So when accepting cash, it pays to be knowledgeable about the crime of counterfeiting.